Last year I wrote about an exciting discovery with the orange coral mushroom, Ramaria largentii, when I obtained a nice purple from a little bag that had been left outside during a frost. The mountain of coral that had dried inside proved to be unusable, giving a blah beige. 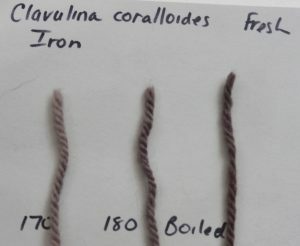 This year’s harvest of coral wasn’t outstanding, but I do have enough in my freezer now to do a few dyepots. First I wanted to make sure that several months of freezing wouldn’t affect the colour. And indeed it didn’t! 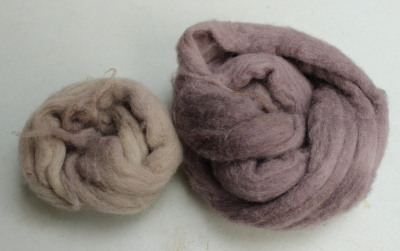 This purple is on wool roving mordanted with iron. 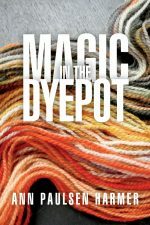 I’ve been away from my studio more than I wanted (although the January trip to Costa Rica was a legitimate reason to be away), but the dyepots are heating up again, with some interesting results. More to come . 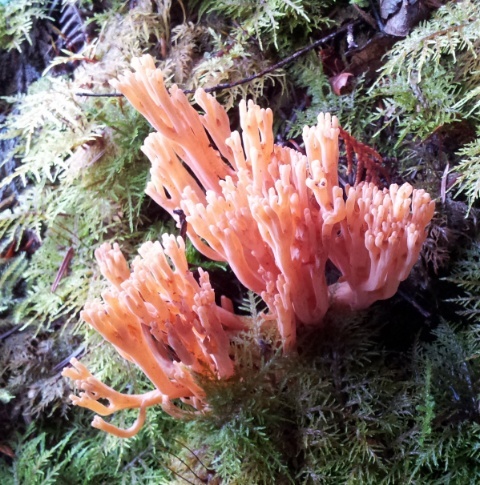 . .
“Study” implies lessons to be learned, and that’s certainly the case with this mushroom, an orange or pink coral (Ramaria gelatinosa). 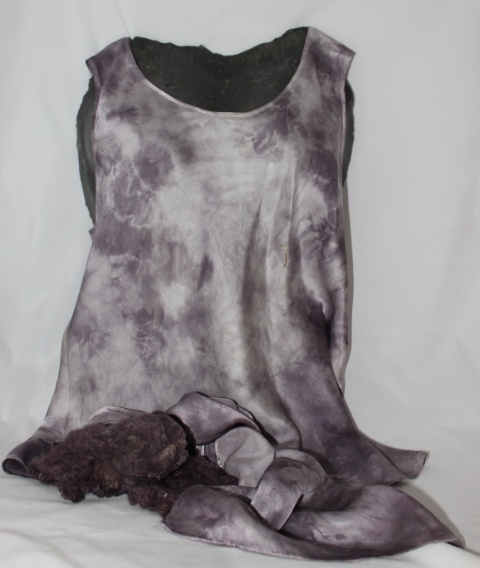 When I first started playing with mushroom dyes, I’d read that this one would give purple if an iron mordant was used, so I popped a good handful of the mushroom into my little sample dyepot, along with my mordanted samples, and boiled the life out of it, only to find an interesting grey at the end of the process. I even blogged about it at the time. Despite my suggestion then that I’d try that one again the following year, there were so many more mushrooms to try that I walked on by the orange/pink coral . . . until this year. 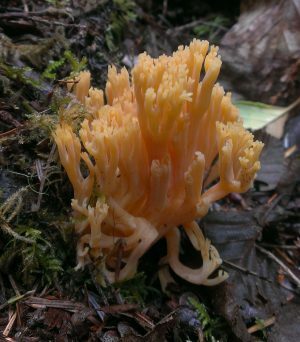 The forest provided such an abundance of this coral mushroom this year, along with everything else, that I decided to collect what I could and try again. But since I was spending every available minute out collecting all kinds of mushrooms, I did with the coral what I did with all my other treasures: I spread it out on newspapers to dry. Energized by this result, I tried another sample pot with a handful of dried coral (of which I had mountains by this time) . . . which resulted in an insipid grey. The mountains of dried coral went back to the forest, my gift to the mushroom fairies. Another lesson learned. I had enough fresh coral left for a good-sized dyepot, from which I got these colours on some Corriedale batts. I’m thrilled, of course, although the last lesson from this mushroom is the hardest to deal with: patience. I have no more Ramaria to play with this year—but that makes this purple all the more special, doesn’t it?